“Shoulda, Coulda, Woulda,” describes the strategies of many when it comes to loading their horse into the trailer. Not until the day creeps upon us do we realize just how important trailer loading practice can be, for us and our horses. You may have heard the idea that “preparation and planning prevent poor performance.” This couldn’t be truer for trailer loading as well. We often think we don’t have time to practice loading with our horse. But in actuality the reality is just the opposite; you don’t have time to not practice trailer loading. By taking that time, in the long run, you will not only saving time but future frustrations and time pressures. And possibly, more important, you are creating and strengthening the bond and trust-based relationship between you and your horse. As part of a clear plan take an active part in your horse’s education and welfare. As their guardian it behooves you both to understand how your horse’s mind ticks. “Bribe your horse!” – Horses are not predators, meaning they have never needed to hunt for their food, kill prey and then reap the reward. Their food is right under foot! Therefore, although they do see value in food for comfort and nourishment, they do not see the same value as other species in gaining food for reward. “Drag or push him into the trailer!” – Horses are “into pressure” beings. This phenomenon has developed over 54 million years and forms part of their survival trait. They lean into anything they perceive to be pressure in order to protect themselves. If not taught to come off pressure they will raise their heads up high, lean backwards, stop or even run the opposite direction. So, pushing or pulling only enhances their suspicions and behavior patterns. “Put the ramp up quickly!” – This is the worst thing you can do once your horse has loaded. Horses are naturally claustrophobic so by closing the ramp before your horse is comfortable you will create additional pressure, not allow them the freedom to experience a release of pressure. Instead, let them leave and reenter the trailer again and again. This way your horse will gain confidence and comfort both in and out of the trailer. Remove all time-constraints on the day of loading, stay calm and relaxed. Your horse reads your intentions, agenda and your emotions. Let him see that you are not under pressure. If you are nervous or under pressure consider utilizing flower remedies or aromatherapy oils for both of you. Lavender is an old faithful! Trailer loading can be a tricky task, bring a friend along until you feel comfortable to load your horse alone. You may ask them to close the ramp behind you (if you have a jockey door), or hold onto the rope through the window as you prepare your horse for this trip. This isn’t the time to be a hero! There was a reason Noah loaded all of his animals in twos! If your horse travels better with his/her partner, why not bring them along for the day? “It’s bright, shiny & new” – You may be proud of how clean and perfect your brand-new trailer looks, but horses are suspicious of new trailers, as they aren’t used to the sights and smells of an artificial shiny metal container. Many may be reluctant to take that first step. So instead of making him face this stressful situation alone, try taking another horse along. Having “old faithful” by his side might be just what your horse needs to feel more comfortable in this uncomfortable situation. “Remember that rather hairy last trip” – well, so do our 4-legged companions. Except for them it would have been even more adventurous in the back of the trailer. They don’t forget their last experience so you need to drive carefully and always take their comfort into account. “He loaded just fine at home” – Horses are associative thinkers. They associate specific events with locations. Imagine individual pictures formulating a movie, this is the creation of a horse’s memory. Take each lesson to new places so your horse learns to load in any given location – 5 is often the magic number! You could be giving your horse the wrong message. Are you hesitating on the ramp? Are you looking your horse in his eyes? Are you expecting him to refuse? These thoughts and gestures all indicate to your horse that it’s best he steer clear of the trailer. Replace all your negative or anxious thoughts with positive ones. Act like your horse loads every time. This image not only transfers to your horse telepathically, but is also received energetically down the line and is reflected physically in your body language and movements. “Eyes are the window to the soul” – you can hide behind a smile, but you can’t hide behind your eyes. They reflect your true emotions. At the same time if you look your horse in the eyes throughout a loading session you are communicating to him in his language to stand and not come to you. Think about the times you have witnessed your horse speak to another horse – the first gesture they make connects them to one another through eye contact. They often follow this with a reprimand, guidance or a request. Couple this with your posture or a hesitation in your footfall and you are relaying to your partner to stand still or be concerned with what is coming. Try placing your eyes on your horse’s chest or feet to read their next thought. You can also use your peripheral vision to watch their facial expressions to gain insights into their thoughts. 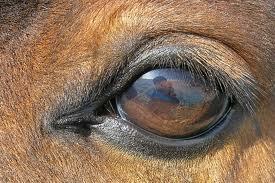 Horses drag their eyes, rather than snapping them onto new objects as humans do. Consider dragging your eyes to where you would like your horse to come. We have a window of 3-8/10th of a second to reward our horse for trying. It’s within this window he associates your reward with the action. The art of listening to your horse is to capture his thoughts and reward him in a timely fashion. Look for the change in his eye, the flick of his ear, the swish of his tail and the muscle movement. As your horse is about to perform, stay out of his way. Discover what your horse perceives as reward. Is it the rub on the forehead or the neck, the release of physical pressure, your soothing voice, a pulsing pressure or just pure rest? Build in different rewards so that there is clarity between desirable and undesirable behavior. Horses move away from discomfort into comfort. The easiest and fastest way to teach a horse to stand would be to ask for forward motion with the pressure halter, gain no response and return to rub your horse on the forehead. By doing this you are reinforcing standing! The path of least resistance should always be the direction and task you have in mind for him to complete. Horses follow their noses! Not only will this allow you and your horse to keep your eye on the target, it will create focus. As your horse learns to maintain attention he equally learns about the path of least resistance. By capturing the whisper, you will be able to guide him to his final destination. Follow these simple tips and you will not only save time and aggravation but, most importantly, you’ll build your horse’s confidence and comfort level around the trailer. And the next time you have to take a trip your horse might just walk right in on his own.